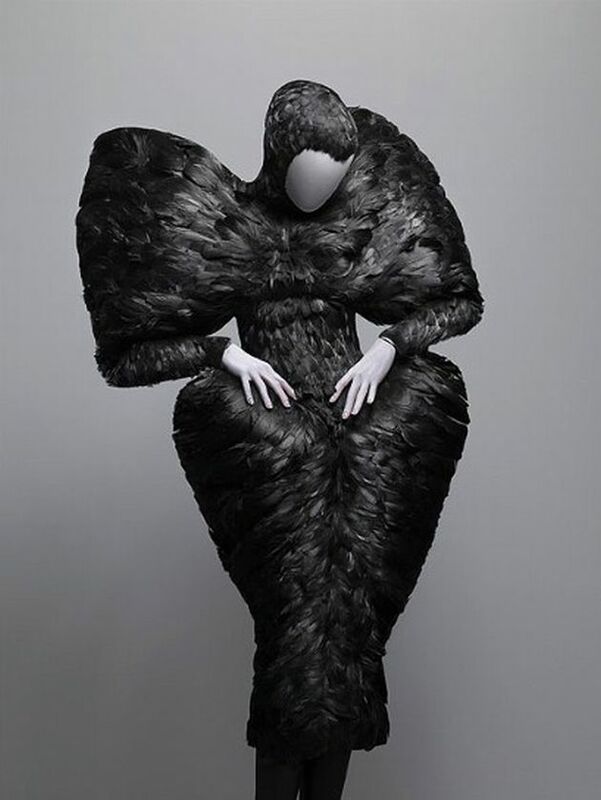 Thankfully, the Alexander McQueen show at the Met is finally ending. Under the right conditions, it might have turned into another Happy Land disco, where a fire took the lives of 87 New Yorkers back in 1990. Even the threat of fire could have caused one of those mass stampedes like the one that killed a Wal-Mart worker and injured shoppers on Black Friday in 2008. The most significant esthetic effect of the show is the way it so accurately duplicates the claustrophobic experience of an MRI. Once you have entered, you realize you are not getting out until, like sludge, you finally make it to the end of the sewage pipe. Alexander McQueen made clothes, but is this an example of the Emperor’s New Clothes? Oh, you Philistine, this accusation is like saying that anyone could paint a Pollock. No, it’s worse! It takes great talent to put one over on the public. Romanticism and Scottish nationalism are constantly used to tout McQueen’s work, which is more reminiscent of the Addams Family than anything else. One keeps waiting for the articles of clothing to come to life and reenact the famous Forth Bridge scene from Hitchcock’s The 39 Steps. Instead one is inflicted with a mirror behind which one finds video of a naked woman blanketed by moths, which is arguably the most fashionable image in the show. As you may glean, behind the disruption his work caused at the normally serene old Met, McQueen had things to say, but this is neither the time nor the place to preach to the ever-increasing choir of admirers. Getting back to the experience of actually attending the exhibit, what other comparisons can be made? Rush hour on the 1-2-3, Heathrow during one of its frequent work stoppages or after the eruption of Eyjafjallajökull. Oh what fools these mortals be! I think you have the wrong metaphors; it was more like mosh pit. Had you realized that you might have enjoyed it more. But too bad it took away from your admiration of the product, exquisitely made, no less unbelievable than a lot of high end woman's clothing design but here artfully exploiting of today's cinema and graphic media. Admittedly hard to see (I missed whatever may have been seen in under-shoulder level cases in the first two rooms) the craft in the objects equaled and possibly in some instances surpassed the designs. I couldn't help but wonder how the making of such complex fabrications was financed (think Jeff Koons). Who were the underwriters of their manufacture and of the exhibition? And who profits from the success? Also apropos the Met and the attendance success of the show is the forthcoming opening of Met modern annex in the Whitney building on Madison Ave. Expect to see a lot of art exhibited there seeking support of a younger elite, and the Met recipient of donated (tax deducted) objects that previously would not make the cut. Expect to see more crowd pleasers - next time you should visit earlier in the run.